Eliza and I have just had six wonderful days in Christchurch together. She was competing in the singing competitions, which culminated in the Dame Malvina Major Aria Competition on Monday night. It was a fantastic night of music and song. And then we had the thrill of hearing Eliza being named as the winner! Great celebrations! Soprano Eliza Boom has won first prize in the the prestigious Dame Malvina Major Foundation Christchurch Aria. The 23-year-old competed alongside 14 aspiring young opera singers in Christchurch at the weekend, culminating in the Aria final on Queen’s birthday. 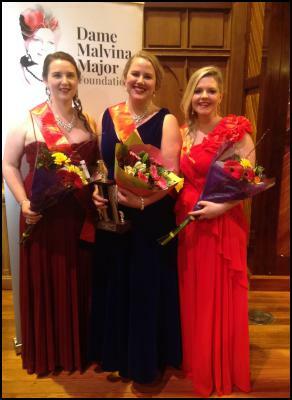 Second place was awarded to soprano Ingrid Fomison-Nurse and third to soprano Sophie Sparrow. Currently a Dame Malvina Major Scholar with New Zealand Opera, Eliza grew up on the stage, singing with her large Whangarei-based family. She studied under Dame Malvina Major at the University of Waikato and was last year a finalist in the IFAC Australian Singing Competition where she was awarded a scholarship to study at world leading conservatoire, the Royal Northern College of Music in Manchester. Eliza says it was a thrill to be named the winner of the Christchurch Aria, a competition which is very special to her. “This was my fourth year participating and every time has been wonderful. The committee, volunteers and singers are so wonderful to work with and it was a fantastic night of singing from everyone, which makes the award an even greater honour. She says the Dame Malvina Major Foundation has supported her singing even when she was just starting out. Adjudicator Barry Mora said he impressed by the camaraderie of the competitors and their support for one another. He encouraged all the singers and noted the huge role teachers, parents and accompanists play for singers at this stage in their development. What wonderful news! Congratulations! All the best for your adventures in Manchester! Awesome! Well done Eliza, and well deserved, no doubt!